Now the weather is getting warmer and there has been glorious hours of day light into the evening, my mind has been turning to making more salad dishes. One of the Vegetarian Recipe Club’s most popular salads – in fact dishes of all time – is an Avocado and Smoked Tofu Salad with Mustard Vinaigrette. It is the most amazing combination of flavours and something I make quite regularly just for the pure pleasure of it. The intention with a rather over-ripe looking avocado and a block of smoked tofu (I use Taifun brand), was to turn it into said salad. But we fancied something a bit more substantial for lunch. So, after spotting a small pot of homemade pesto left over in the fridge, I decided to combine the base ingredients with pasta to make a bigger salad. It was really tasty and a great, quick lunch. 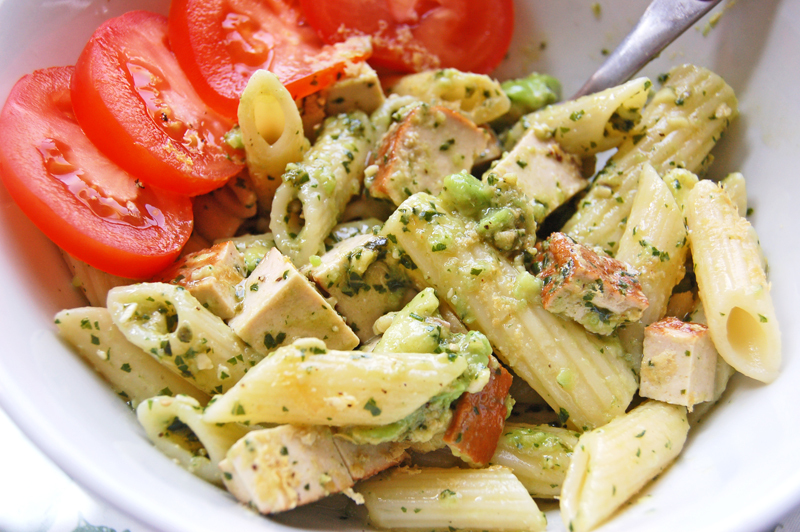 If you can make your own pesto, I would recommend it (it does taste so much nicer than from a jar). See my previous blog about making Wild Garlic Pesto. 1. Bring a medium-sized saucepan of lightly salted water to the boil and cook the pasta according to packet instructions (usually about 12 minutes). Drain and set aside. 2. Prepare your other ingredients; chop the avocado, tofu and tomatoes. 3. When the pasta has cooled, transfer into a large salad bowl and mix in everything else. I laid the tomato slices around the side of the bowl separately. 4. Enjoy with some green salad leaves, such as watercress, spinach and rocket. NB: Smoked tofu, vegan pesto and nutritional yeast flakes are available from good independent health stores, or online at Goodness Direct, for example. Some supermarkets now sell vegan pesto in their ‘free from’ ranges too. Today, I’ve been cooking and photographing for Viva!’s Vegetarian Recipe Club. Despite a pair of aching feet and an increasingly big baby bump, I managed to make three lovely dishes which I thought I’d share with you. I’m particularly pleased with the final one – a Chunky Avocado, Artichoke and Black Olive Dip. I wasn’t even sure it was going to happen – as I’d brought a rather soft-feeling avocado this morning and was rather worried it would be completely over-ripe on opening. The lovely people in Bristol’s Sweet Mart even gave it to me for free. So I was delighted when I cut into it and found it perfect to eat. The dip itself is like an adventurous take on guacamole. The other two dishes are a creamy Quick Thai Yellow Curry and a Vegan Muttar Paneer. Click on the pictures to be taken to the recipes on Vegetarian Recipe Club.